Experiencing record high or low temperatures affects people’s stated belief in climate change, new research finds. The work began when Robert Kaufmann, professor of earth and environment at Boston University, and PhD candidate Xiaojing Tang wanted to develop a new measure of local climate change based on record high and low temperatures in the US. This index, called TMax, rises as the number of recent record high temperatures increases relative to the number of recent record low temperatures. After Tang calculated TMax using data from weather stations across the United States, he presented a map to Kaufmann, who was surprised to see a pattern. Will we care about climate as weather gets nicer? The climate picture is complicated because the US is both warming and cooling. If climate in the country remained stable, only about 5 percent of weather stations would, simply by chance, show local warming or cooling. Instead, Kaufmann and his team saw that nearly 50 percent of weather stations had high values for TMax, indicating local warming over time. Unexpectedly, about 10 percent of weather stations showed local cooling, with more frequent recent record cold temperatures. Looking at the map, warming areas are located at the coasts, cooling areas in the middle of the country, near the Ohio and Mississippi rivers. 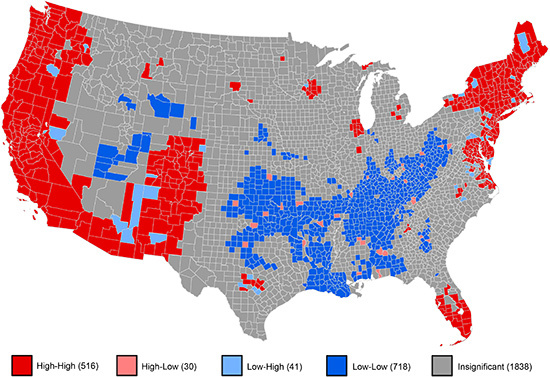 When Kaufmann and his collaborators compared the map of TMax directly to Howe’s, they found a correlation: in counties where recent weather was dominated by record low temperatures, a smaller percentage of people were likely to agree that global warming was happening. Why might this be? Study coauthor Jacqueline Liederman, professor of psychological and brain sciences at Boston University and director of the university’s Cognitive Neurophysiology Lab, believes it’s because humans are prone to learn from their own experiences. What they hear from leading scientists doesn’t dissuade them from what they see for themselves. “We know people have certain biases,” says Liederman. One of these biases is something called “recency weighting,” the tendency for people to assign more value to events that have happened recently, even if they don’t fit a long pattern over time. This was especially true for counties that experienced recent low temperatures. Even if the data showed that record high temperatures were more recent over the past 30 to 50 years, people in counties where there had been many record lows since 2005 were more skeptical of global warming. Liederman explains that the research also reflected an effect called “confirmation bias.” Essentially, it isn’t easy for anyone to accept information that goes against entrenched beliefs, so conflicting evidence is ignored. The effect of confirmation bias was one-sided in the study, found only in areas where there were recent cold temperatures. If you are more likely to trust your personal experience, and it’s been cold recently, you can discount a rogue record high temperature as just a hot day, rather than evidence of global warming. Areas with more record low temperatures tended to be in traditionally conservative areas of the country, counties where belief in global warming was already low. Climate change is a politically charged topic in the United States and stark divisions exist along party lines regarding how serious the problem is and what the consequences will be, according to the Pew Research Center. But Kaufmann’s study found that local climate affected people’s willingness to believe in global warming beyond what party affiliation would suggest. Kaufmann’s group is planning a future project to better determine whether political allegiances affect how people learn from experience. In the meantime, he hopes that what he and his colleagues have learned from this study will help change the way that scientists communicate with the public about climate change. “I think climate scientists have to step back and rethink…and use very different sorts of evidence to convince people that climate change is real,” he says. Funding for the study came from the Robertson Foundation and the British Academy.